It’s a bit overcomplicated. The only piece in that picture which doesn’t play a role in the Dreamcast development process is the scanner. 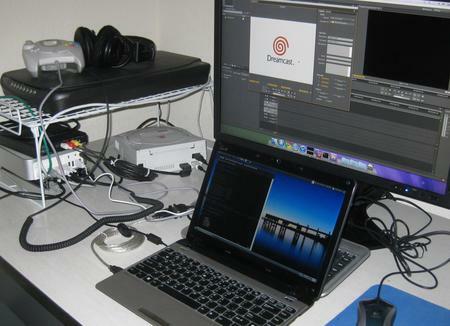 The Eee PC does the heavy lifting of development (i.e., text editing and cross compilation) and uploads to the Dreamcast via a special serial cable. Those are the most essential parts and are really the only pieces necessary for a lot of algorithmic stuff (things that can be validated via a serial console). But then I have to go up a level where I output video. That’s where things get messy. The Mac Mini and giant monitor really just act as a glorified TV in this case. Ideally, it will be more than that. The DC outputs audio and video via composite cables to a Canopus DV capture bridge. That’s connected via FireWire to the external hard drive underneath the Mac Mini, which is connected to the Mac. Adobe Premiere Pro handles the DV capture / display. One day I hope to have something worthwhile to capture. To review, this is a library for playing RoQ video files on the Sega Dreamcast. It has a lot of problems right now, many of which are listed in the README file. It comes with a Dreamcast/KOS sample player. It also comes with a simple Unix testing utility which decodes a file to a series of PNM files. If anyone is interested in debugging RoQ again after all these years that it has been supported in other open source programs, there is still a bug in the video decoder that produces some notable artifacts. Also, here are some samples I generated that appear to meet the data rate requirements laid out in this post. These samples are based on this sample media set from Xiph.org. I have been working on that challenge to play back video on the Sega Dreamcast. To review, I asserted that the RoQ format would be a good fit for the Sega Dreamcast hardware. The goal was to play 640×480 video at 30 frames/second. Short version: I have determined that it is possible to decode such video in real time. However, I ran into certain data rate caveats. First off: Have you ever wondered if the Dreamcast can read an 80mm optical disc? It can! I discovered this when I only had 60 MB of RoQ samples to burn on a disc and a spindle full of these 210MB-capacity 80mm CD-Rs that I never have occasion to use. There are open source RoQ decoders out there but I decided to write a new one. A few reasons: 1) RoQ is so simple that I didn’t think it would take too long; 2) it would be nice to have a RoQ library that is license-compatible (BSD-like) with the rest of the KallistiOS distribution; 3) the idroq.tar.gz distribution, while license-compatible, has enough issues that I didn’t want to correct it. Thankfully, I was correct about the task not being too difficult: I put together a new RoQ decoder in short order. I’m a bit embarrassed to admit that the part I had the most trouble with was properly converting YUV -> RGB. Here’s an honest engineering question: If you were tasked to make compressed video play back on a Sega Dreamcast video game console, what video format would you choose? Personally, I would choose RoQ, the format invented for The 11th Hour computer game and later used in Quake III and other games derived from the same engine. This post explains my reasoning. 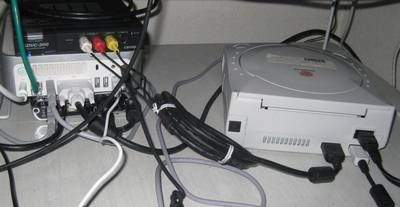 One of the things I wanted to do when I procured a used Sega Dreamcast back in 2001 was turn it into a set-top video playback unit. This is something that a lot of people tried to do, apparently, to varying degrees of success. Interest would wane in a few years as it became easier and easier to crack an Xbox and install XBMC. The Xbox was much better suited to playing codecs that were getting big at the time, most notably MPEG-4 part 2 video (DivX/XviD). The Dreamcast, while quite capable when it was released in 1999, was not very well-equipped to deal with an MPEG-type codec. I have recently learned that there are other hackers out there on the internet who are still trying to get the most out of this system. I was contacted for advice about how to make Theora perform better on the Dreamcast.